Two great events for 2019!!! Last year, we had over 400 teams from all over the Midwest and Canada attend our NCAA certified events. In 2019, we will be back for our 5th year with two great events during the live periods. Our headquarters features 8 new full-size wood courts under one roof which is great for teams and college coaches coming to view prospects. We live stream both of our events on BallerTV and have a lot of college coaches and scouts on hand to evaluate prospects. Some of the past participants in our events over the past few years include: MoKan, Iowa Barnstormers, Iowa Attack, Kingdom Hoops, Milwaukee Spartans, Oklahoma Wolfpack, Oklahoma PWP, KC Pacers, KC Spurs, KC Elite, Oz Elite, KC Premier, Martin Bros, Quad City Elite, Spiece Indy Heat, Chicago Select, WOTN, D1 Minnesota, Minnesota Heat, Team Nebraska Express, Nebraska Select, Nebraska Thunder Elite, Team Factory, OSA Crusaders, Iowa Mavericks, Iowa Pump-N-Run, SSA Elite, Iowa Elite, Team Iowa, Hoffman Hoops Academy, Next Level, Grassroots Sizzle, Wisconsin Academy, Team Arsenal, Kansas Elite, Kansas Hoggs, Minnesota Crossfire, Mo Team Carroll, Missouri Flight, Missouri Combat, Illinois Bears, and many, many more. 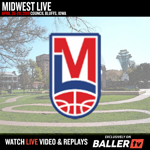 ©2019 Midwest Live! / SportsEngine. All Rights Reserved.